Most vibration machines on the market today are oscillating machines. 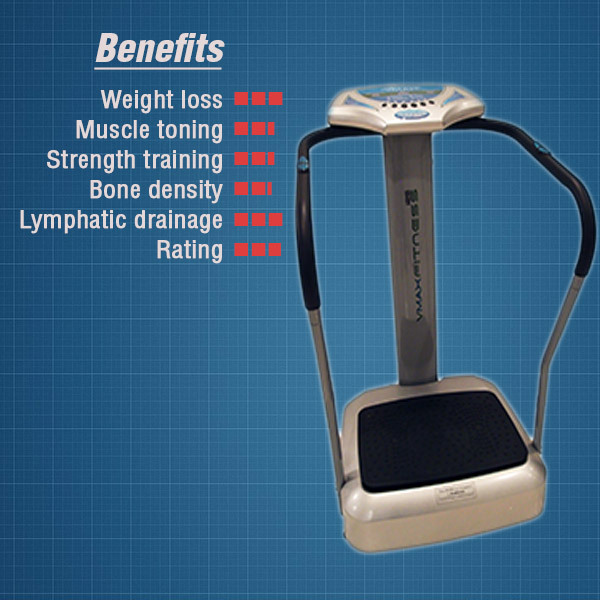 The vibration plate vibrates from a centre axis in a see-saw like motion. Build quality between vibration machines differ significantly with varying speeds and motor sizes. This style of vibration has a high amplitude and slower speeds compared to other vibration styles. Oscillation machines are superb for healthy weight loss and swelling reduction. Other benefits include enhanced lymphatic drainage and stimulation, and increased blood circulation. 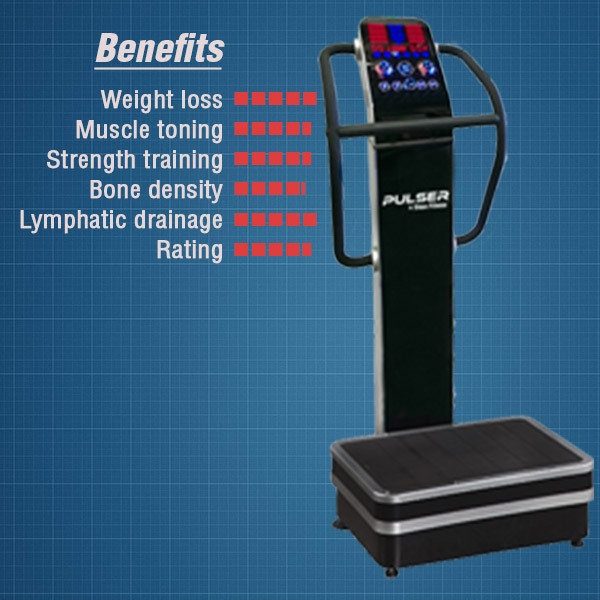 These vibration machines are commonly found in weight loss centers, especially Lipo-Laser clinics. Just because you are on a budget it does not mean you can settle for a non-performer. 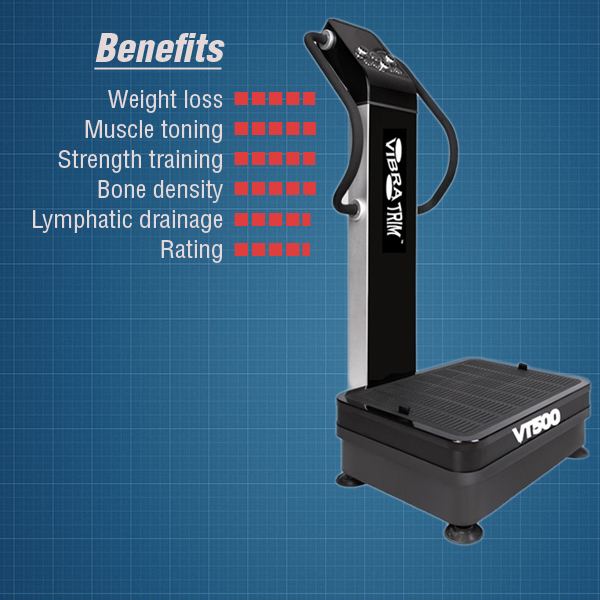 The Vivovibe 260 is a budget-conscious, full-size compact machine that offers some of the lowest vibration frequency in an oscillation machine. The low frequency makes this machine extremely effective for lymphatic movement, body detoxification, and managing body wide aches and pain. Whether you're a casual exerciser, an aspiring athlete or medical practitioner, the M2.0 is a workhorse that can put out high and low G-forces with its 1000 watt motor and custom designed logic chip. The all metal construction with reinforced handle bars and large platform makes this the ultimate machine for home or professional users at an affordable price. Sturdy metal platform with a high density soft rubber top. Highest weight limit of any machine on the market at 440lbs! Pin holes on platforms allow hand straps to be attached and transfers vibration directly into upper body. Extra large control panel with shortcut buttons for time and speed. LEDs display calories spent. Easy on/off switch for ease of use. The Vmax i25 is a high quality home user machine. The machine has been redesigned in 2013 for a fresh new look. Functional quick access buttons are added to the control panel with an easy to read LCD display. 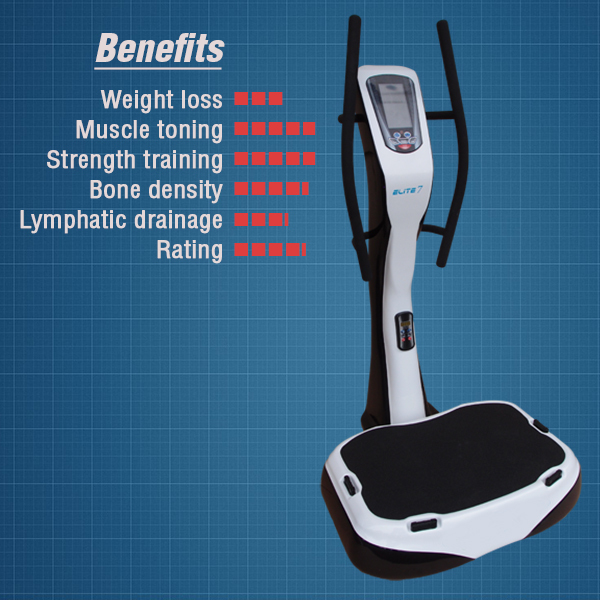 The only vibration machine in the market that comes with 9 preset exercise routines, a premium feature not found in other machines in this price category. Simple and practical. LED displays time, speed, and mode. 9 user selectable pre-set exercise programs. Allows for time adjustments for longer exercises. Metal base with a hard plastic top with acupuncture knobs. Top is extremely easy to clean and resists everyday wear and tear. Great for use with socks or shoes. Built in the same manufacturing plant as the more expensive branded machines from competitors such as Hypervibe and VibraPro, the Tectonic M1.0 uses the same engineering know-how and strict production processes as the other brands to produce this affordable quality machine. A large standing platform, premium oscillation motion, and sturdy front mounted handle bars allows for unobstructed exercise movements and maximum workout results. Durable steel constructed with a high density soft rubber mat with built in acupuncture knobs that further improves blood circulation. Wide 7" LCD with large white LED illuminate buttons for elegance and simplicity. Special features include BMI, calorie counter, and time adjustments. Triplanar vibration is a newer addition to vibration machines. The vibrating platform does not move just vertically up and down, it also moves horizontally. You can think of it as moving in a circular fashion while moving up and down ever so subtly. Triplanar vibration has a lower amplitude and a much higher speed setting compared to the other styles. This vibration style is most suitable for strength work outs with workout periods limited to 30 seconds to 90 seconds per exercise posture. 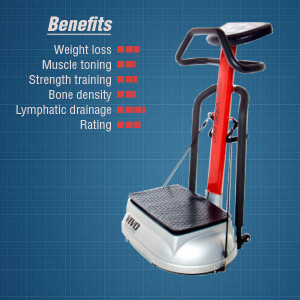 It is excellent for increasing bone density, and especially muscle toning and strengthening. They are often used by professional sports teams and Triplanar vibration machines are very effective in helping develop explosive muscle strength. This style of vibration machines typically develop G Forces in excess of 8 Gs and is excellent for helping increase bone density and muscle strength. The Elite 7 is a feature-filled triplanar vibration workhorse with a beautiful 7" LCD display. 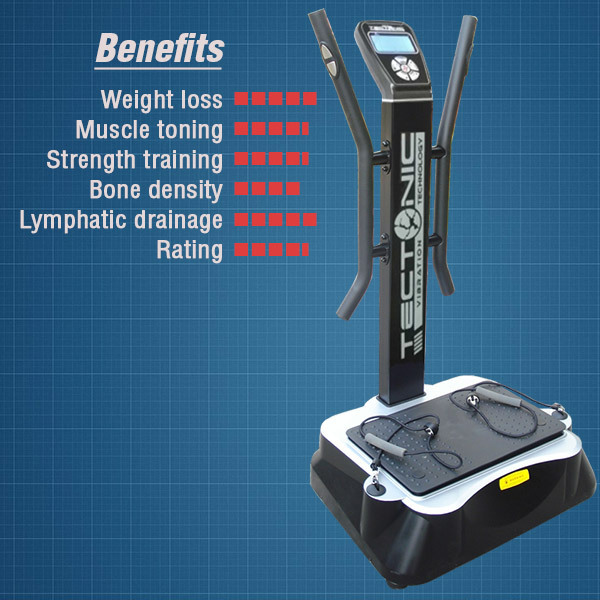 It is one of the most advanced vibration trainers on the market today. Extremely durable and commercial grade rated, core strengthening, stretching, improving balance, strength training, and massage are just some fitness aspects you can achieve. Extreme wide, heavy duty studio class metal platform. Non-slip surface. Holds upto 440 lbs. Comes with secondary foam mat for greater comfort with bare feet or lying down. 7" LCD main console with a secondary console on the pole. Personal virtual trainer shows exactly the time interval and type of exercise to perform. 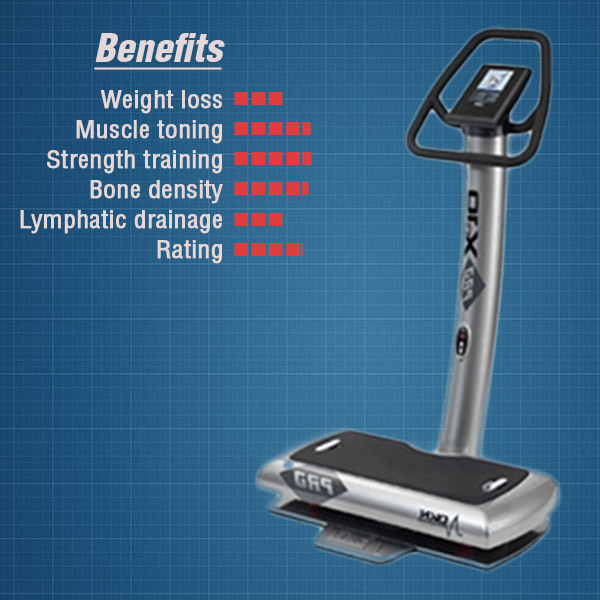 The DKN XG10 Pro Whole Body Vibration Trainer is an innovative new model of the high intensity vibration exercise machines designed to help burn fat, build lean muscle, and improve overall health in just minutes a day. With its state of the art high acceleration motor, silent performance and variable frequency vibration, the DKN XG10 Pro delivers powerful results at the touch of your fingertip. 12 integrated pre-set programmes designed to enable concentrating on specific body parts controlled via a 3D touchscreen display. Durable steel constructed super wide platform. Comes with a dense foam dampening mat for greater comfort. 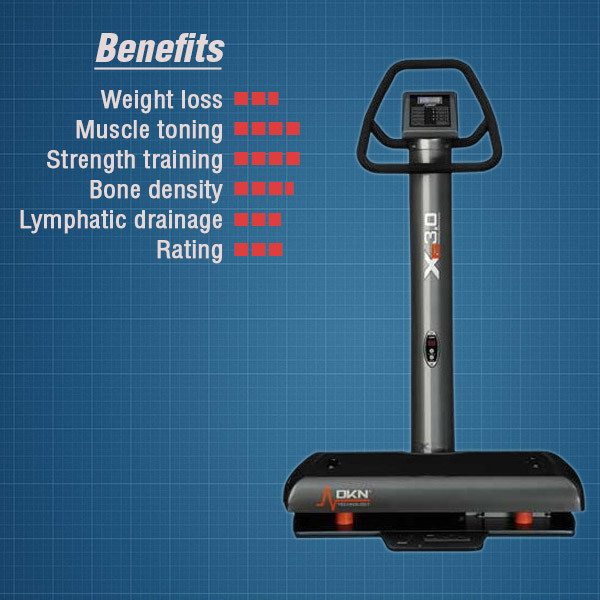 The DKN XG3 vibration trainer fits perfectly into any sized home or apartment. 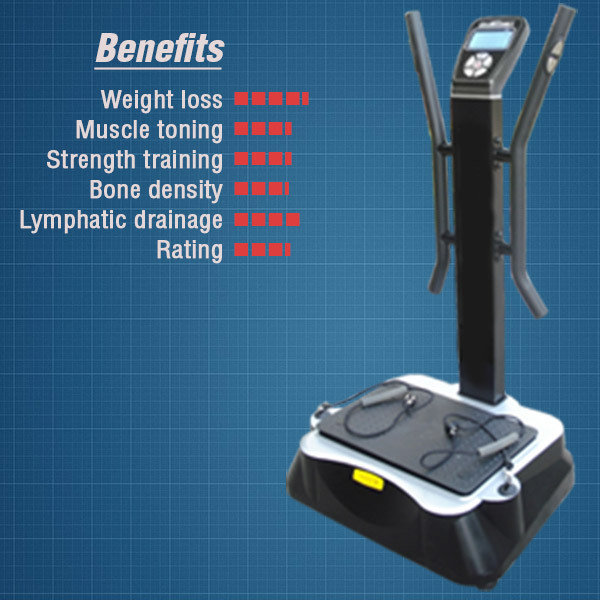 Featuring an advanced motor and the latest electronic technology, the DKN XG3 vibration trainer effectively improves blood circulation, bone density, muscle response and overall full body health. Combined with an integrated 5 module workout system, the DKN XG3 quickly and easily enhances performance and speeds recovery time, promoting overall fitness and flexibility. 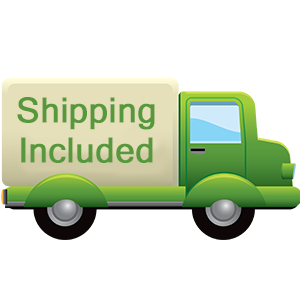 Durable single piece steel construction with no moving plastic parts. Non-slip surface great for shoes or bare foot. DKN Personal Coach and backlit LCD display, with 7 frequency setting and 5 training modules and Hot Start (quick-start) mode. The newest kind of vibration machines on the market currently. 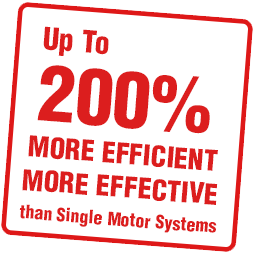 Dual vibration machines have two separate motors that produce two different vibration styles. One is oscillation, and the other either triplanar or a third style, spiral vibration. Spiral and triplanar vibrations are very similar and the only difference between them is that triplanar motors are generally more energy efficient. The efficacy for both of these vibrations are the same. These dual vibration machines allow the user to combine both the oscillating and triplanar (or spiral) vibration and realize the benefits of both vibration types. They are very effective for weight loss, lymphatic drainage, pain relief, and in addition to strength training, improved bone density, and muscle toning and strengthening. This new generation of vibration machine offers the most health benefits of vibration training built into one single device. 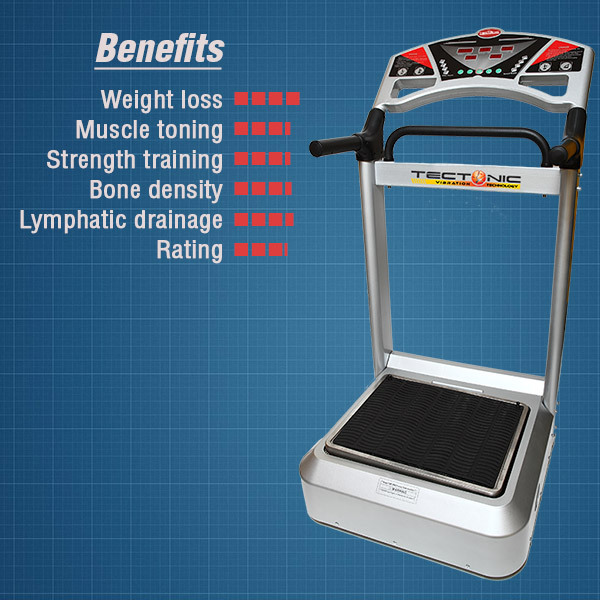 The Vmax Fitness Trio dual motor machine is an ultra durable unit good for professional or home use. Constructed fully of steel, it is an extremely stable machine that will last. The highly advanced Trio allows users to create flexible custom designed exercise routines and to control the two motors independently for maximum versatility. Beautiful glossy LED display. 3 built-in preset and 6 user defined programs. Dual control allows independent control of vibration. Durable steel constructed with a high density dimpled soft rubber mat. Rear wheels for easy moving. 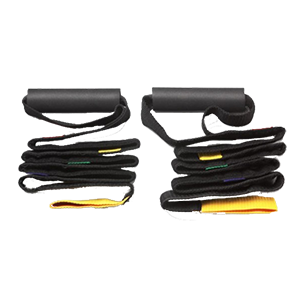 Side attachments allow hand straps for upper body exercises. 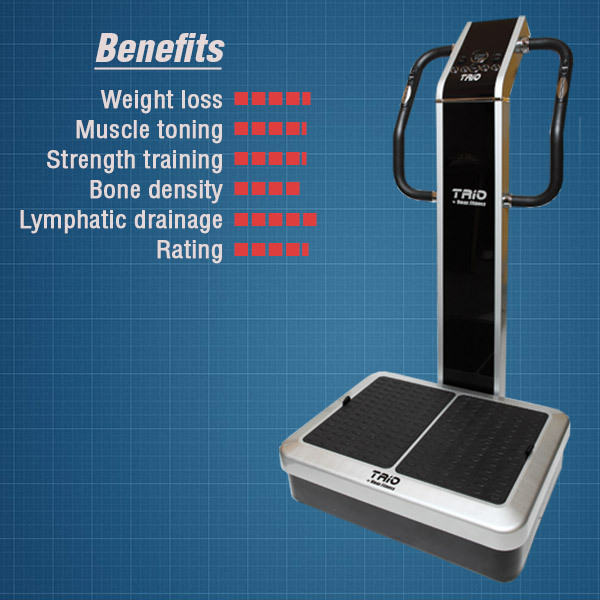 The Vibratrim VT500 is currently the most advanced first class luxury whole body vibration machine on the market today. A highly sophisticated control panel with responsive rotary dials for rapid speed adjustments; full steel construction; a brand new ergonomic handle bar system; and a 3rd Generation High Efficiency Drive system that makes it upto 200% more effective in strength training then conventional machines are just some of the latest engineering incorporated into this machine. It is the most advanced dual vibration machine on the market today. Large LED displays for time, speed, and mode. Rotary speed dials allows on-the-fly and rapid speed changes. Interface for designing custom exercise programs. 3 built-in exercise programs and 3 user definable programs. Durable steel constructed with a high density dimpled soft rubber mat. Carbon fiber accents and trim. Largest platform size of any home models.